Big skies, great wildlife, silver beaches, amazing wildflowers......this trip around the beautiful Southern Isles of the Outer Hebrides is a journey of contrasts. It is a great holiday for wildlife enthusiasts; the Uists in particular are home to staggering numbers of wading birds, such as lapwing, redshank, dunlin and ringed plover. Birds of prey are also common, and there will be a good chance of seeing golden eagles, short eared owls and hen harriers. There's so much to explore on this holiday - picking a selection of walks has been really difficult, because there is enough to keep any walker busy for a month! However, we believe the programme set out below gives a great introduction to the various islands, and will guarantee a memorable week. Weather permitting, the finale of the holiday will be a fabulous boat trip out to the deserted island of Mingulay - a spectacular wildlife haven at the very southern tip of the Outer Hebrides. The price includes a boat trip to Mingulay. If bad weather prevents this from sailing you will receive a refund of £50. The start point for this holiday is Inverness Train Station. Clients are required to make their own way to the start point. You will be collected at Inverness train station at 9am and we will spend the first day travelling to Skye, where we will catch the afternoon ferry to Lochmaddy in North Uist. Our first full day on the Uists will be spent exploring the beautiful island of Berneray, linked to North Uist by a causeway. With stunning sea views and one of the finest areas of flowering machair in the whole of the Hebrides, you will soon see why the island is a favourite of Prince Charles! Our second day will take us to the gorgeous Udal peninsuala, at the north end of North Uist. Here we will discover beautiful beaches, fascinating archaeology and abundant wildlife. The views from the peninsula are simply stunning, with numerous off-shore islands floating in the characteristic turquoise sea of this part of the Hebrides. A superb day walking part of the new Hebridean Way long distance path. Our route heads out to the east of the island, around the beautiful Loch Druidibeag National Nature Reserve, before heading south through the wildflower meadows and rich birdlife of the South Uist machair. A wonderful island with a character all of its own, Barra never disappoints. For our penultimate day we will explore the beaches of Vatersay at the far southern end of the island. 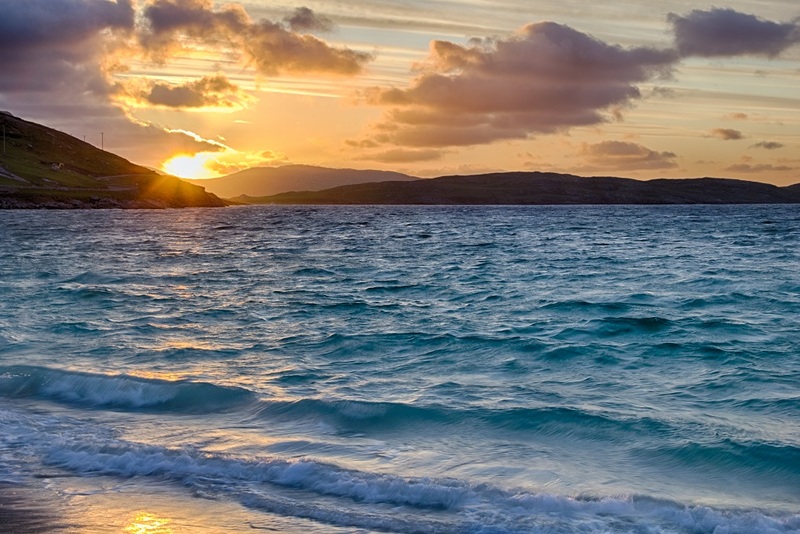 With its flowering machair grasslands and fascinating archaeology, Vatersay makes for a memorable day out. Our final day is an unforgettable boat trip to the uninhabited island of Mingulay, which together with its neighbouring islands of Pabbay and Berneray (another one! ), make up the southern tip of the Outer Hebrides archipelago. Seabirds galore, towering sea-cliffs and well preserved abandoned villages will make this a wonderful end to a unique holiday. ​The return trip to Inverness is a great way to end the holiday! We will sail from Barra to Oban, an amazing trip with views of the Inner Hebridean islands of Rum, Eigg, Muck, Canna, Coll, Tiree and Mull along the way. From Oban we will drive back to Inverness, arriving there by about 6pm. Alternatively, if you are feeling adventurous, you can fly back to Glasgow from Barra, departing on the small Twin Otter plane that takes off from Traigh Mhòr beach at the north end of the island. This holiday starts and ends in Inverness. Your guide will meet you at the entrance to Inverness railway station at 9.00am where you will join the rest of the group for the drive up to Skye and the ferry to North Uist. What's Included: 6 nights accommodation, 5 days walking. Accommodation at local quality guest houses*, with full Scottish or continental breakfasts; packed lunches; evening meals at local restaurants (note that lunches on the final day are not included). ​All transport during the holiday, including ferries between Skye & North Uist, Eriskay & Barra and Barra & Oban. Boat trip to Mingulay. The services of an experienced walk leader. * We will be staying in carefully selected island guest houses. All rooms will have ensuite or private bathrooms. Single occupancy rooms are available at an additional cost of £120. This holiday involves staying in two separate guest houses (three nights in each). We start off with three nights in North Uist and end with a further three nights in Barra. ​These holidays go at a gentle pace, with plenty of time to stop, take pictures, soak up the atmosphere and watch the wildlife. However, they are still walking holidays, so you will need to be able to cope with a reasonable amount of hiking each day. As a guide, you should be able to manage some uphill sections, be comfortable walking for 5 hours and 7 - 10 miles or so each day, and be confident walking away from paths - for example over rough, grassy hillsides. I booked a walking holiday with Hidden Hebrides this past July, exploring the Uists and Barra, and was very pleased with my choice. The information that we received before the trip was very complete and informative. We were a small group of five people from a variety of backgrounds, and we all got on well together from the time we met in Inverness. Our guide , Eilidh, was delightful company. She is a Gaelic -speaking journalist who herself lives on one of the Hebridean Islands. She was very well organized and well informed, and the daily schedule worked well, even when members of the group wanted to add side trips to see particular members of the local fauna! The accommodations, mainly small guest houses, were well chosen, comfortable, with very large breakfasts. The picnic lunches consisted of a stop at a local grocery store, where we could choose items to suit our own tastes...and which were then purchased by our guide. Dinners were in a variety of local restaurants, and again these were well chosen for their food quality and menu variety. I particularly enjoyed a restaurant in Castlebay where our food was served with the sounds of a Scottish fiddle. The walking, often over the Machair, sand dunes, wide white sand beaches or mountain trails was at a relaxed pace and we were able to spend time identifying the wildflowers and the sea birds. An added bonus for me was the flight off Barra to Glasgow, which took off from a sand beach! I can highly recommend Hidden Hebrides, and I would book again with them. A spectacular place to wander, I've had an excellent week in the Southern Outer Hebrides with Mick Blunt and 3 fellow wanderers. Mick guided us expertly while we enjoyed the breathtaking scenery. My treat was a quick glimpse of a corncrake. Mick organised everything while we relaxed and stayed in comfortable B&Bs and eat in excellent restaurants. I'm looking forward to another Hidden Hebrides treat next year, maybe Orkneys if there's a space for me. This was my second trip to the Outer Hebrides with Hidden Hebrides, this time visiting the southern Isles of Uists and Barra. It is a very friendly experience with stunning walks & scenery, quality B&Bs and good food. The real added plus for me is the different guides that are all local people. Eilidh MacLeod guided us this time with her knowledge & experience of wildlife and plenty of the stories about the people of the Isles made it a beautiful and heartfelt journey!